St.Patrick’s Day! It’s coming round the bend with all the leprechon’s prepared to whack you over the head with a sheleighly sticks(they are very temper-mental you know). So the question is…How are you really supposed to celebrate Saint Patrick? 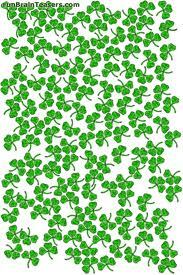 Well, the one thing that has never failed me on a holiday is (a) Candy and (b) Decorations and nothing says, “Welcome, you crazy leprechon’s!” like four-leafed clovers!